Blog posts are no longer just means to inform and educate your audience. They can turn fairweather visitors into rabid followers of your blog, if not loyal customers of your business! However, you need to write posts with the intent of converting readers into becoming your loyalists who you can monetize effectively. Writing posts to achieve this is no easy feat—there are numerous factors you need to consider in order to optimize your posts for increasing your returning visitors or making a sale or adding viewers to your email list. In this post, you will learn ideas for blog posts that will convince readers to commit to your call-to-action. I will also share with you content templates that you can emulate on your blog, as well as examples of each to help guide you in creating content that converts. Review posts are common among blogging sites. A well-thought-out review shows how the product or service works so that readers can make an informed decision. For reviews to work, they need to be written objectively and without any bias in favor of or against the product. Therefore, writers need to be honest with their reviews and not deceive readers for the sake of making a point. I present this Media.net review as an apt example. The post sufficiently covers Media.net as a formidable Google AdSense alternative and details what to expect—not only the features but also what makes Media.net unique and different from Google AdSense. This is what readers want to know more about if they wish to monetize their content by running ads on their site or blog. It’s not a lot, but it goes to show that providing an objective review of a tool or product will yield conversions! Nothing screams “SOCIAL PROOF” like case studies. A key problem with blog posts attempting to sell a product or service is the lack of proof. Writers compose the post with the intent of making a sale but do not provide information on how their business actually helped people increase their sales. Case studies solve this problem as they take readers on a journey on how people succeeded with the help of your product or service. Take this Drip post on Medium for example. It details how they helped Ninja Outreach recover trial signups using Drip’s Amazon-like behavioral emails. Ninja Outreach implemented Drip’s two-step signup that allows them to gather the emails of those who opted for their free trial. Instead of losing the user forever after the trial, Ninja Outreach can follow up with a series of emails in the hopes of getting the user to engage with them once more. The two-step signup produced 65 more signups a month for the use of their paid tool. The post goes to great lengths in documenting the entire process, with screenshots, GIFs, and statistics to back up the study. At the bottom of the post are links to the two-step signup blueprint and a 21-day trial of Drip. In this post, Drip came up roses because of how effective their email marketing platform is. It perfectly captures how they can help brands like Ninja Outreach, one of the most popular outreach platforms in the market, improve their sales. Doing so, in turn, helps convince readers to try out Drip as well! Listicles are arguably the most popular type of content online because they present information in a clear and concise manner. The title, which normally includes the number of points mentioned in the article, already sets reader’s expectations for the post. Also, they’re not overloaded with information like evergreen content is, making them much more digestible and easier to understand for casual writers. So how can you use listicles to generate higher conversion rates on your blog? 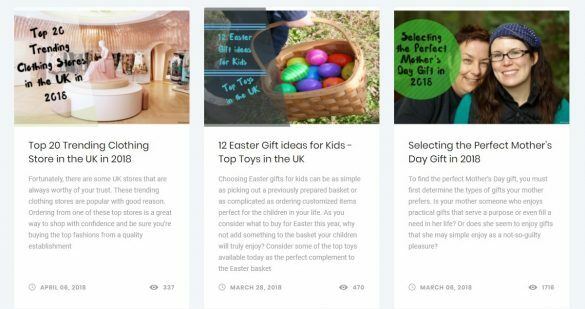 MyUKMailbox is a UK parcel forwarding service that uses listicles to great effect. Since their brand isn’t as compelling as others, they need to be creative with their content marketing to generate signups for their services. A quick look at their blog section reveals the many listicles they’ve written over the years. In the post “Top 20 Trending Clothing Store in the UK in 2018,” MyUKMailbox lists UK clothing stores that people need to watch out for. By featuring UK stores in the post, it compels non-UK residents to sign up for an account on the site so they can purchase items from the stores, have them delivered at their UK address care of MyUKMailBox, and delivered to your doorstep, wherever you may be! Possibly the polar opposite of listicles in terms of length and depth, long-form posts are comprehensive pieces of content that basically spoonfeed readers with actionable items in relation to the content’s topic. Long-form posts leave no stone unturned to deliver the goods. Mailshake recently published the Email Outreach Playbook, a guide on how to do cold email outreach the right way. It details the actual steps that you need to consider before sending out your cold emails. The guide also provides templates that you can swipe and use to increase your campaign’s reply rate. 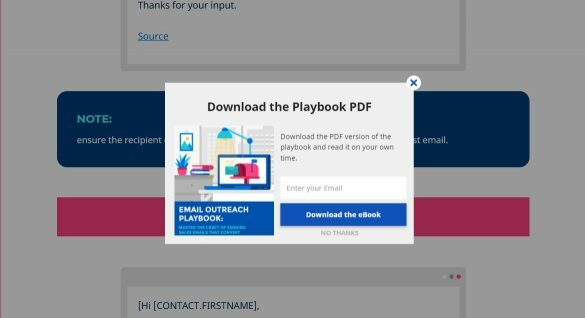 In the post, pop-ups appear on the page that asks you to sign up for a Mailshake account and download the playbook in PDF format. Due to the quality of the guide, you owe it to yourself to execute at least either of the CTAs. Also, the post positions Mailshake as one of the premier tools and resources for all your cold email outreach needs. It is common for marketers to create posts with the goal of promoting their tools and resources. The best posts use those very tools and resources as the “missing piece” in the article. After writing a detailed blog post, they use the tool or resource as a resolution to the problem. If the article made compelling points, then the chances of people subscribing to your tool or downloading your resource guide are very high. Recently, SEMrush updated their Ranking Factors study to include more recent information for the benefit of its audience. To get a copy of the guide, they need to download it from the landing page by entering their email address. To increase downloads of their resource guide, SEMrush published a post that reveals the exact process they used to come up with the study. It broke down the framework they employed to provide technical SEO specialists a better understanding of the process. The article also answers common questions about the study to give readers further details. The entire post builds up the SEMrush study, which is offered at the bottom of the post for download. Prior to that, the conclusion offers tips on how to use the study, given the information presented in the post. As the “missing piece,” people will want to download and use the guide, ensuring that they put all the actionable items in the post to work. By taking a strategic route to your content creation efforts, using the ideas for blog posts above, you can engage your audience more and encourage them to sign up or purchase your service or product. 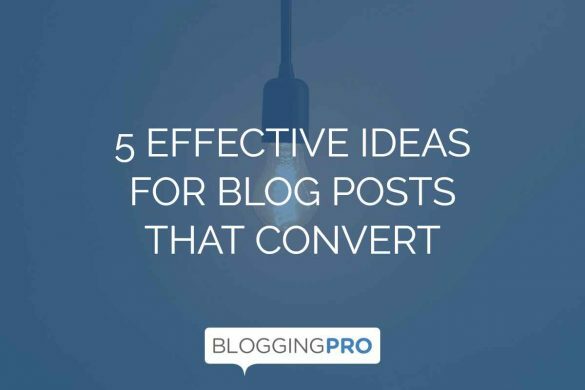 The examples for each of the blog post ideas also show how you can implement them on your blog. The type of post you’ll write depends on your blog’s niche. For instance, review posts work best for affiliate niche sites while long-form posts and case studies are perfect for brands that want to showcase their services or tools. Have any tricks of your own on how to increase conversion and engagement with your blog posts? Share them by commenting below!